This is a capacious home on a spectacular elevated vantage point with panoramic views across the countryside. Sitting on a split-level site measuring approximately one acre, this fine property boasts clean and contemporary style that transitions seamlessly between the interior and exterior, with French doors and decking on two levels. The property features four bedrooms, four reception rooms, and four bathrooms, as well as a sun room and extensive garage. Coveted aspects include self-contained guest accommodation, games room with bar, and landscaped gardens with a south-facing rear garden. 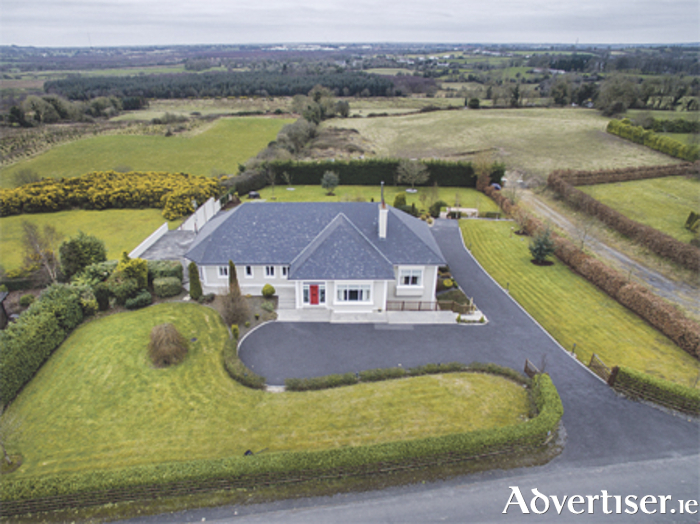 Located on the N55 high road from Ballykeeran, on the opposite side of the road from the ‘viewing point’, the property is in close proximity to Glasson village, Lough Ree, and many amenities, and on the bus route to local and town schools.